Diminished chords are an important part of any jazz guitarists harmonic palette, as they will come up in jazz tunes. They can be used in a variety of harmonic situations when applied to comping, chord melody, and chord soloing. In this lesson, you will learn how to build Dim7 chords and how to play them on the guitar. You will learn diminished drop 2 and drop 3 shapes, and two important functions of diminished chords. To finish, you will play a comping study over a Bb jazz blues progression. What is a Diminished Chord? How Do You Make a Diminished Chord? What is the difference between a half diminished and a diminished chord? Diminished chords are some of the easiest to build chords from an intervallic standpoint because they only use the minor 3rd interval. In order to build any Dim7 chord, you start on the root note and then stack m3rd intervals on top of that root until you come to the next root note (four notes later). Diminished chords are symmetrical because they consist of only minor 3rd intervals. Because each interval is the same when it comes to Dim7 chord construction, you will notice that each inversion has the same shape. This makes learning diminished chords easy on guitar. You learn one shape (the root position) and then simply use that same shape for each inversion up the fretboard (each 3 frets from each other). From G to Bb is a minor third, from Bb to Db is a minor third, from Db to Fb (E) is a minor third, and from Fb back to the root is a minor third as well. Although a half-diminished chord (m7b5) and a (fully) diminished chord look similar from a name point of view, they are different in formula, as well as function. A half diminished chord has a flat 7. A diminished chord has a double flat 7. 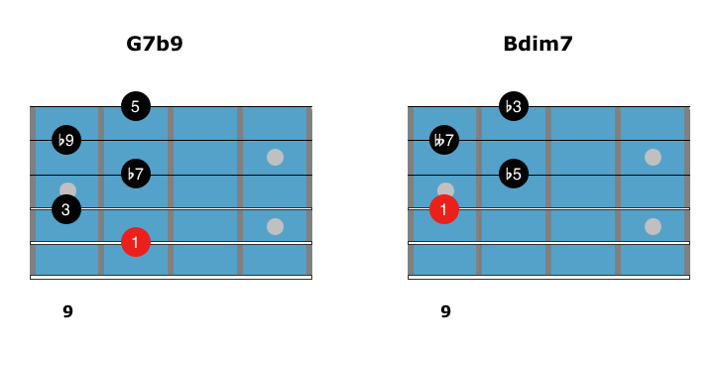 A half diminished chord is most often used as the ii in a minor 2-5-1 chord progression or as a chord substitution for non-altered dominant chords (playing Bm7b5 over G7 for example). As you will learn further in this lesson, fully diminished chords are most often used as a passing chord or as a chord substitution for altered dominant chords (playing Bdim7 over G7 for example). Here is a chord chart with all diminished chord shapes you need to know. Because the diminished chord and its inversions have the same shape, there are only 5 shapes to learn. The first set of diminished chords on the chart are drop 2 chords, which are shapes that don’t have any string skips in their construction. I’ve included the 6543 string set here for those that want to learn them. Although chords on this string set can be useful for some situations, they tend to be muddy sounding when played on guitar. You might want to use a drop 3 chord shape when playing the lowest note on the 6th string. Moving on, you can learn how to play Dim7 chord with drop 3 chord shapes in your studies. Drop 3 Dim7 chords have a string skip between the lowest note and the top-3 notes of each shape, as you can see below. When you take diminished chords and their inversions to the fretboard, you will notice that the interval order changes for each inversion, but the shape on the fretboard stays the same. Note that there is no difference between the notes of G°7/Bb (the first inversion of G°7) and Bb°7. This goes for all inversions of diminished chords. In this section, you will learn how and when to use diminished chords. After you have learned how to play and build Dim7 chords on the guitar, you can apply them to jazz chord progressions. The first example of how to apply diminished 7 chords to jazz tunes is in as a passing chord between other chord changes. There are two ways in which you can apply passing Dim7 chords, ascending and descending. Let’s start by looking at ascending passing Dim7 chords. The first example of a passing Dim7 chord can be seen in the first four bars of any Rhythm Changes, where you often find a #Idim7 chord between the Imaj7 and iim7 chords of the progression. This is the Bdim7 in the first bar between Bbmaj7 and Cm7. Connecting the Imaj7 and iim7 chords in this way allows for a smooth, chromatic bassline, brought out by the passing quality of the Dim7 chord between those two diatonic chords. Try putting on Band in a Box or a backing track and apply the chord shapes you learned earlier in this lesson to the first four bars of the tune, outlining the #Idim7 passing chord in the process. Another common use of passing Dim7 chords is to apply them between iiim7 and iim7, as well as iim7 and Imaj7 (descending). This is similar to the chord changes you find in the bossa nova tune How Insensitive, a common tune called at jam sessions. Here is how those passing Dim7 chords look and sound in a progression similar to that in How Insensitive. Once you have understood and heard how these chords function, try playing through them in a variety of keys using the chord shapes you learned earlier in this lesson. 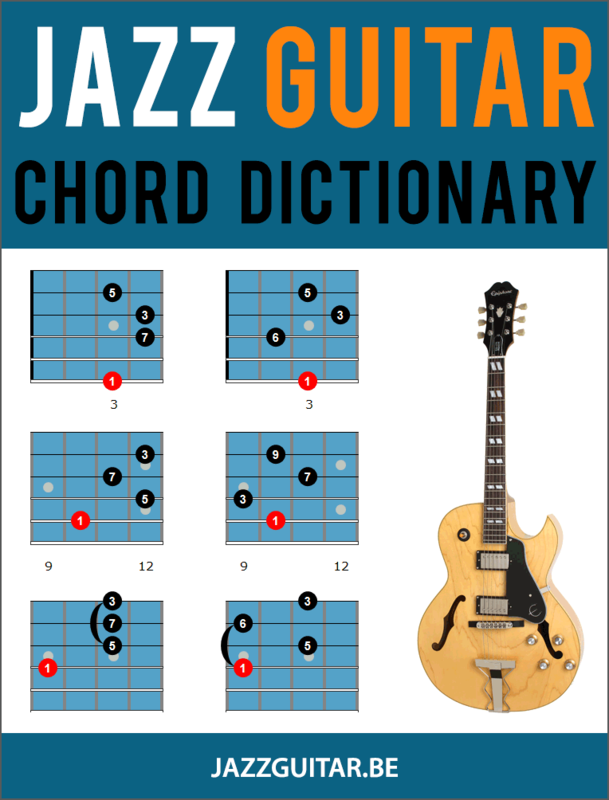 The second commonly used application of a diminished chord in jazz is as a substitution for dominant 7b9 chords. Play a Dim7 chord from the 3rd of any dominant 7th chord in order to produce a rootless 7b9 chord. This allows you to outline the sound of the 7b9 chord, doing so with a smaller, four-note shape. In the diagram below you can see that a Bdim7 chord has the same notes as the 3rd, 5th, b7th, and b9th notes of a G7b9 chord. This allows you to play a Bdim7 chord in place of a G7b9 chord in your comping and chord soloing. To finish your introduction to diminished chords on the guitar, here is a comping study written out over a Bb jazz blues chord progression. This study uses Dim7 chords in bars 2, 6, 8, and 11 of the progression.